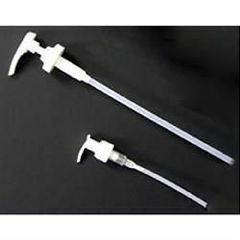 Our bottle pump is made mostly of polypropylene (recycle code 5) plastic. Available in 8 oz only (64oz pump shown is not longer available). This pump is great for easily dispensing many different types of oils and lotions.